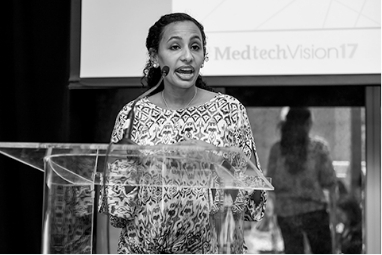 In a world thick with healthcare conferences, MedtechVision, held September 15-16 at the Rosewood Hotel in Menlo Park, CA, stood out, both for its quality of content and for its participants. Vanier was commenting on his experience as a male attendee at the conference, which was intended to provide a platform for the many women executives in the medical technology field to wield the microphone. Some 200 women and 3 intrepid men spent two days in a room hearing from some of the most influential and experienced provider, corporate, government and investment executives representing medical technology organizations nationwide. If you are a man and reading this article, don’t run away yet. What was most notable about the conference overall was that it wasn’t for women and about women—rather it was intended to give a platform to executives who just happened to be women and who are rarely given a place at the microphone to talk about general medical technology issues that apply to the entire field. No “bikini medicine” here; this was a conference about health and business in a world where bringing new medical technology to market is getting ever more challenging. Organized by Covidien, Abbott Vascular, and a number of other organizations with leadership roles in the field of medical technology, the conference gave healthcare executives a chance to come together to learn and problem-solve within this highly stressed and rapidly changing field. The presentations and panels covered emerging regulation and reimbursement issues as well as the challenges of nurturing medical technology companies in a rapidly changing healthcare industry. Not only was it unusual to see a conference like this where all of the experts were women, but it was also unusual to see a medical technology conference where the issues of cost and the need for evidence-based medicine were so closely coupled in the context of innovation. Presenters and panel members, including executive representation from public and private companies, the FDA, numerous hospital systems, insurance carriers, and private equity firms, were all female, but it was their mountain of experience and knowledge that stood out, not their hairstyles. Keynote speakers included Ginger Graham, former CEO of Amylin Pharmaceuticals and former group chairman, Office of the President, Guidant Corp.; Bray Patrick-Lake, president & CEO of the PFO Research Foundation; and, Ellen Zane, president & CEO of Tufts Medical Center. Zane’s message to the audience was right on point: Providers must reduce needless variations in care, insurers must reform their administrative practices, employers must stop offering the world to employees while complaining about costs, governments must pay adequately for needed care, and consumers must take responsibility for their own behavior when it comes to their health. Without great advances toward these goals, Zane noted, the healthcare system cannot evolve beyond its troubled state. I had the opportunity to lead a panel entitled Healthcare Costs and their Connection to Innovation, which featured Dr. Deneen Vojta, senior vice president of United Health Group’s Center for Health Reform & Moderniziation; Dr. Molly Coye, chief innovation officer of UCLA Health System; and Michelle Heying, president & COO of DynaVox Technologies. Much of the discussion centered around how differently payers, providers, and product purveyors define “lower cost” and what standards are used when it comes to innovations that promise to address the rising tide of healthcare inflation. This included both how payers and providers think about the return on investment they get from adopting new technologies, as well as what medtech purveyers take into account when deciding which products are worth bringing to market. Dr. Coye noted that UCLA and other academic medical centers must reduce their cost structures by at least 30 percent in the next 5-10 years in order to survive as viable entities. This is a daunting thought for medtech firms seeking to launch new, higher cost products, even if they can demonstrate better outcomes. Many thought that one of the most eye-opening experiences at the conference came at the end of my panel (lucky me), when I asked the participants, ” What is the most profound medical technology innovation of the last 5 years that achieved the goal of improving quality while reducing cost?” All of the panelists cited products that were actually from the healthcare information technology (HIT) world, not the traditional medtech world, as the ideas that have and will continue to make the most difference: remote monitoring technologies, tele-ICU, the iPad/iPod, and Facebook, which Dr. Vojta noted as the “biggest anti-depressant drug ever developed and better at curing loneliness.” At the cocktail party that followed the panel, there was much buzz about the rising importance of HIT, how medtech and HIT were rarely discussed in the same conference, let alone the same breath, and how woefully uninformed the medtech industry is about HIT issues that could present huge business opportunities. The conference came to a close with a panel featuring four highly successful company founders, each of whom has seen her idea through from origination to dramatic success, both clinically and financially. Karen Talmadge, co-founder Kyphon, Denise Zarins, co-founder of Ardian, Stacy Enxing Seng, co-founder of ev3, and Erica Rogers, co-founder of Viogen and Allux Medical spoke about the interesting tensions between inventing and financing “iterative” ideas vs. “white space” ideas. It was noted that industry leaders tend to gravitate to iterative concepts while founders find wilder ideas much more interesting and attractive, even though the risks are greater. Notably, three of the four founder panelists stated emphatically that they do not believe they could successfully bring their business to fruition today given the far more challenging regulatory, reimbursement, and funding environments. There was a strong message that the increasing scrutiny of the FDA and payers is seriously compromising innovation by raising the cost of getting to the same result, even when the result is of benefit to the healthcare system. It was a sobering message from those who have demonstrated great leadership and success in their field and particularly interesting given the number of FDA, payer and related representatives in the audience. The private equity representatives in the audience clearly agreed about the challenges facing the field and several told me that they were dialing back their investments in medtech as a result. One can only hope that this set of issues serves as a catalyst for further dialogue among the parties rather than the beginning of a downward spiral of medtech innovation in America. Lisa Suennen is a managing director with GE Ventures and former managing member of the Psilos Group, as well as the co-author of Tech Tonics: Can Passionate Entrepreneurs Heal Healthcare With Technology? and author of the blog Venture Valkyrie.